Another day in the swamp. Thankfully because I had gone farther the expected thr previous days, I was out of the swamp after 4 miles. 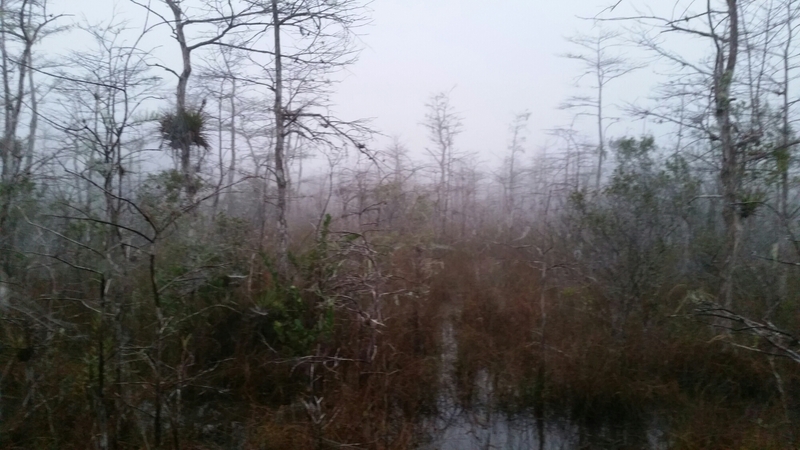 It was a foggy morning which made the swamp look spooky. 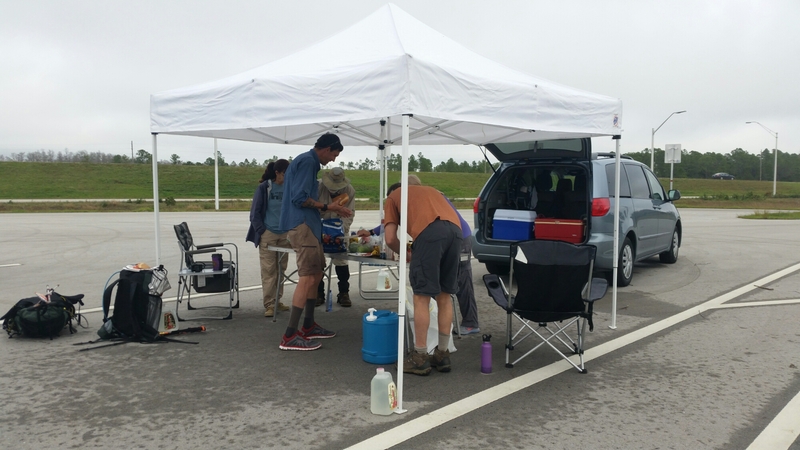 When I arrived at the I75 rest stop, Florida Trail Association volunteers were waiting with trail magic. It was a beautiful sight after 3 days in the swamp. We ate, a lot, washed our shoes and socks the best we could with the muck we had been dragging in the swamp and we were on our merry way once again. The rest of the trail followed an old jeep road all the way to the Seminole Reservation which was nice after the swamp. We saw many alligators and birds. Even one gaitor was too close to the road for comfort. As seen below, FrontPage posing with it to show how close it was. Gladly, it didn’t hiss and we were quickly on our way. 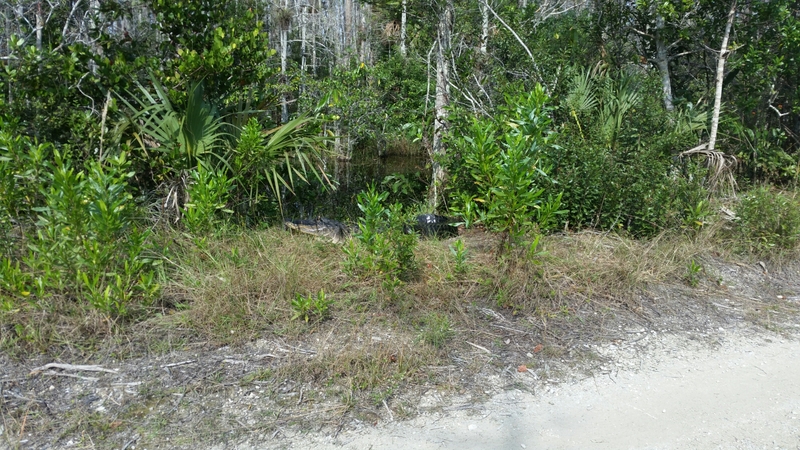 We saw so many more alligators today in the swamp next to this road. The heat made for an interesting day of walking. About 95% humidity and in the 80s. My wet, sandy socks and shoes started to bother me. I believe my feet swelled up and then I started having blisters places I’ve never had one. In between my toes, in those little cracks. Which is painful as every steps makes them stretch… With only 3 miles left to Billie Swamp Safari, I switched over to my dollar store crocs. I couldn’t take it anymore. It was a rookie mistake to have walked in the heat with my crappy swamp shoes. I will learn my lesson. Thankfully my altras are waiting for me in 3 miles. I’M SO EXCITED . I just tore off one of my pinkie toe nail. It feels amazing. Ever since my last death march with the Fox Cities backpacking group, I’ve been waiting for it to fall off. I guess the hike today was the day. Woot. 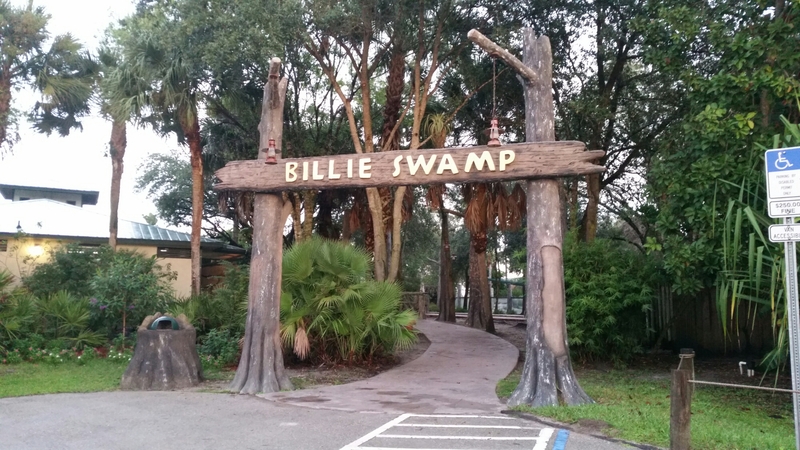 So here we are at Billie Swamp Safari. We ate dinner and saw Syd the sloth eating here already. 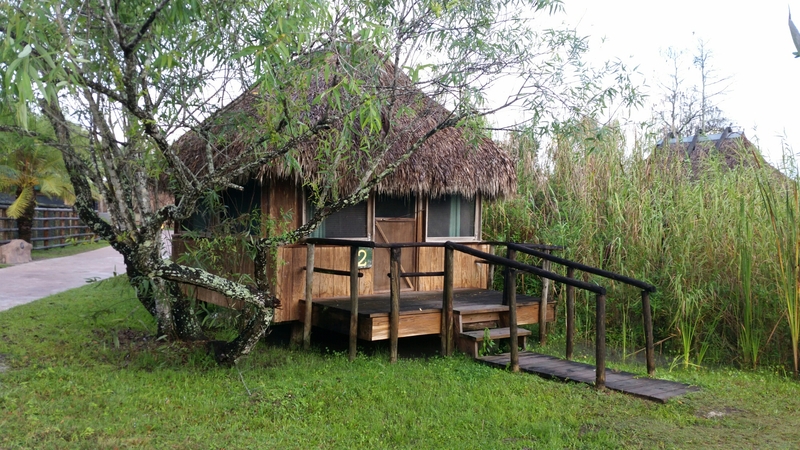 FrontPage and I shared a chickee accommodation. Which was located next to a sad florida panther and the alligator pit. The panther was meowing for part of the night and the alligators were fighting with each other. It made for an odd night of sleep. And then the coyotes joined in the orchestra as well as the bullfrogs under our chickee. FrontPage laughed out loud in the middle of the night because it was a bit crazy and unsettling to hear all of these all night long. The chickees are nice, no electricity or running water. It’s just a bed. We made the mistake to look up the ceiling with our headlamps… Spiders, spiders everywhere. We shook our heads and hope they remained where they were. There were shower on site, so we rinsed off our dirty bodies. FrontPage told me he was running in and out of the shower naked ( no one stayed the night here beside us) and grabbing hand soap from the sink. I laughed so hard at his clever idea. All I did was to rinse off. There was a thunderstorm and the loud thunder woke us up at one point, scaring the beejeezus out of us. I am sure all the animals here were awake too. Glad we stayed in a dry chickee. This way we don’t have to be carrying a wet tent all day last our previous mornings. I am hoping to check out the rest of Billie Swamp Safari tomorrow and wish these animals weren’t caged. Oh! I forgot to mention, on our way to the bathroom in the dark last night, a little masked thief decided to raid the place. He was adorable and as soon as i called him out, he ran away. That’s about it for today. 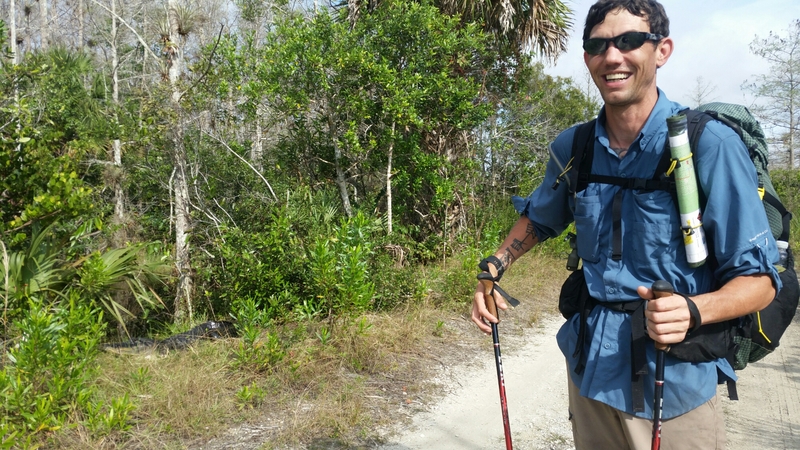 Swamp, trail magic, dry trail, and alligators and lots of them made for a fun day until the toe blisters… I will nurse them back to health and hike strong again. Happy trails!